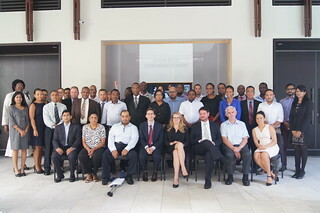 The Global Forum on Transparency and Exchange of Information for Tax Purposes organised, jointly with the OECD, a workshop on the implementation of the new standard on Automatic Exchange of Information (the Standard for Automatic Exchange of Financial Account Information in Tax Matters, or “AEOI Standard”) in the Seychelles from 6-9 July 2015. The workshop, the 7th in a series being held across the globe, was generously hosted by the Seychelles government and was attended by 40 delegates from 12 jurisdictions, mainly from Africa. The workshop was designed to assist government officials in implementing the AEOI Standard. The topics covered included policy decisions, approach to legislation, and administrative considerations, such as organisational and information technology aspects of the new standard. Participants worked on developing implementation plans during the workshop, which could form the basis for implementing the AEOI Standard in their home jurisdictions. The Global Forum is devoting a lot of effort to assist its members implement the new AEOI Standard and ensure a consistent implementation around the world as well as a level playing field. In the past 7 months, similar workshops have been held in Mexico, Germany, Turkey, the Philippines, San Marino and the British Virgin Islands. Further two workshops will be held in Colombia and Malaysia in July and August. In addition a number of pilot projects are underway to assist developing countries that wish to implement the new standard. Click here for more information on the Global Forum.